The Hong Kong government has come under fire for allowing hunters to kill wild boars in response to complaints from Sai Kung villagers and district councillors. 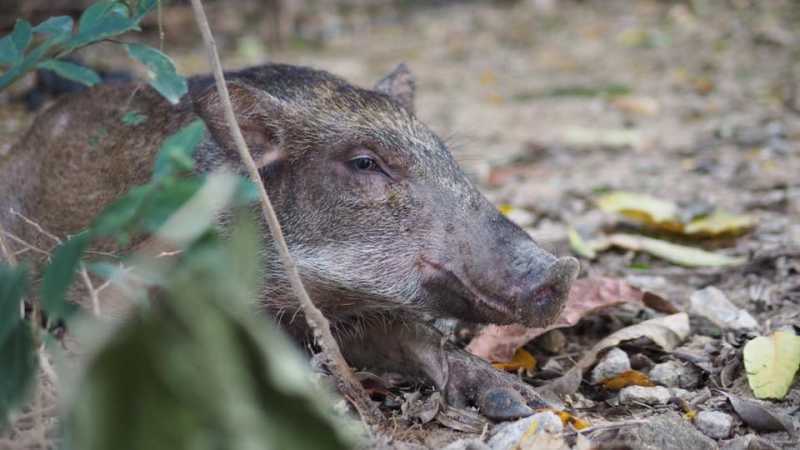 A hunting team was originally scheduled to gun down wild boars in Pik Uk on Thursday with the approval of the Food and Environmental Hygiene Department (FEHD), but the action was called off amid strong opposition. A wild boar in Hong Kong. File Photo: Hong Kong Wild Boar Concern Group. 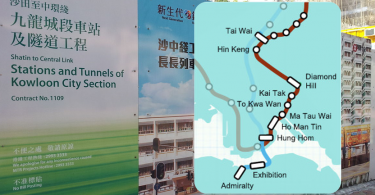 Pik Uk villagers were informed of the hunt on Wednesday after the Sai Kung District Council posted notices in the area. Animal rights groups subsequently appealed to the public to gather at the village during Thursday’s operation in protest. 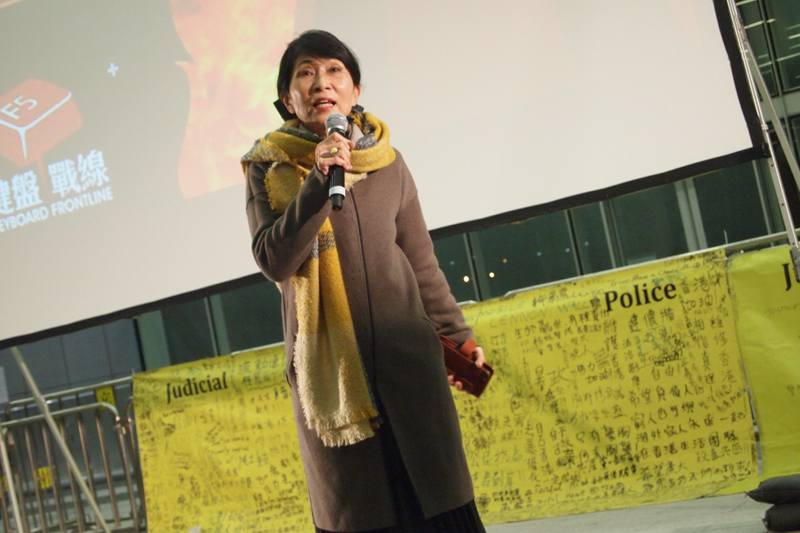 Lawmakers Claudia Mo and Roy Kwong Chun-yu also urged the FEHD to halt the action. In response, the FEHD canceled the event shortly before the scheduled hunt “in order to avoid confrontation.” But the protesters went to the village to ensure the hunters did not go ahead with their plans, as well as to speak with the villagers. 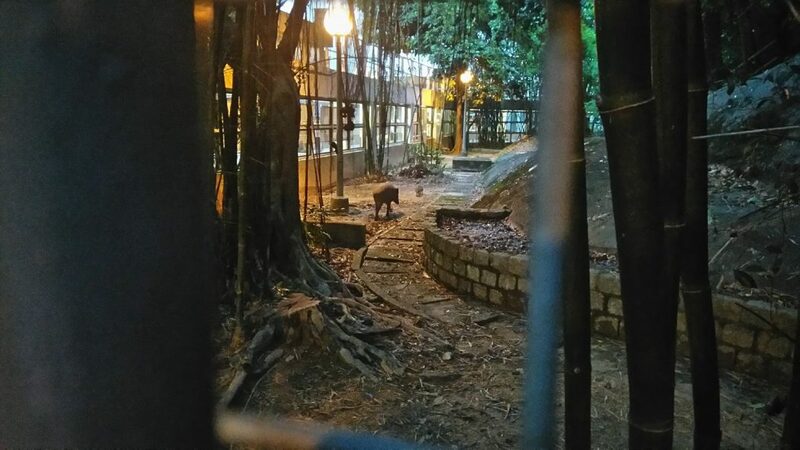 Hong Kong Wild Boar Concern Group’s Roni Wong, who led Thursday’s action, told HKFP that police advised them not to enter the village after some residents – upset that the action was called off – gathered at the entrance. 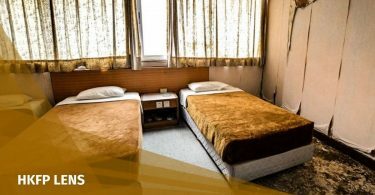 Nonetheless, Wong said, the group managed to speak to a few villagers, who said they did not agree with the hunting and they considered wild boars to be their neighbours. The only trouble the animals bring is getting into the trash sometimes, they told the activists. “It looks like the FEHD only listened to one side and ignored others, including the view that life should be respected,” the activist said. Claudia Mo told HKFP that the FEHD spokesperson assured her that the hunting teams will not be returning next week and different stakeholders will be meeting to discuss the issue. Claudia Mo. File Photo: HKFP. The government told Mo that it approved the hunt after receiving multiple complaints by villagers and a Sai Kung district councillor that some wild boars were aggressive. Sai Kung Councillor Hiew Moo-siew admitted to having complained to the FEHD about hygiene problems caused by wild boars, but said he did not ask the department to kill them, Hong Kong Animal Post reported. He said he is neutral about wild pig hunting, and that it is not a good time to comment because of the opposition of animal protection groups. The government told the Wild Boar Concern Group that some wild pigs had destroyed farms and property, and even attempted to break into houses. “It is completely unacceptable and baseless to use hunting as a solution. There are many preventive measures, with resources better spent on building a society where humans and wildlife can co-exist,” he said. 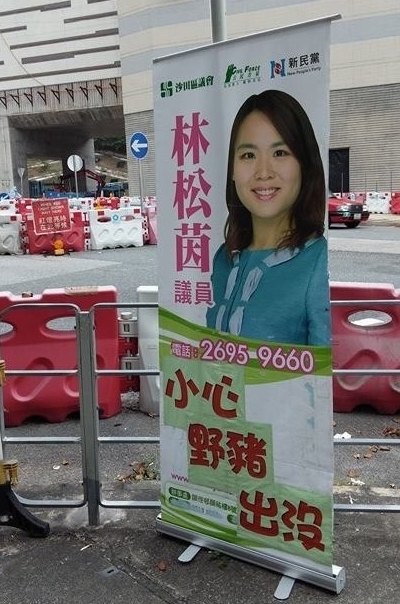 Roni Wong campaigning to raise awareness in the village in Sai Kung. Photo: Wild Boar Concern Group. Leung Mei-po, founder of the Hong Kong Animal Post, told HKFP that there are many ways to avoid human-wildlife conflicts, such as building fences around farmland and refraining from feeding wild pigs so that they will not return. “We think hunting and killing – even eating in some cases – wild pigs is an outdated custom. This practice should have no place in today’s Hong Kong,” said Leung. The FEHD does not have information on its website about past and future hunting actions, nor does it monitor the hunters when carrying out the operation. Leung said the common perception in Hong Kong that wild boars are dangerous pests is wrong and should be corrected. “A starting point is parental and formal education. Some Hong Kong parents complain even at the sight of a cat or dog and make comments not based on common sense. Their kids would then internalise these messages,” Leung said. File Photo: Wild Boar Concern Group. Leung suggested that Hong Kong introduce education to promote correct understanding of animals. “If people simply see them as food with no feeling, it would create ecological disasters,” she said. 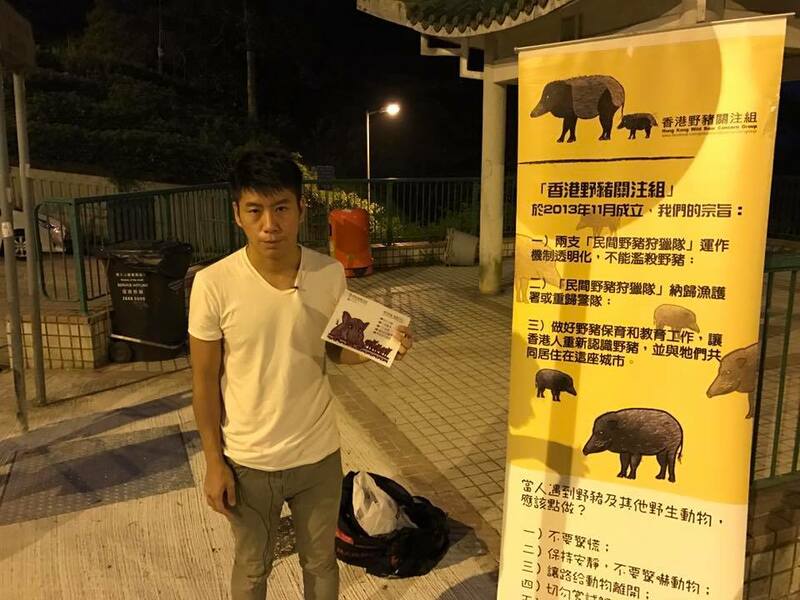 A few local councillors have warned the public against wild boars in their campaigns, such as Shatin councillor Lam Chung-yan of the New People’s Party. Shatin councillor Lam Chung-yan warns people against wild boars. Photo: Apple Daily. Claudia Mo said much work is needed to change the government’s attitude towards wildlife. “The government couldn’t care less about animal rights. The fact that I get to talk about animal rights [at the legislature] under the topic of environmental hygiene and food safety, and that they always deal with these problems at an ad hoc basis shows that the government is quite hypocritical,” Mo said. Two hunting teams were established in the 1970s to target wild boars. There are around 30 members, who are issued arms licences by police and permits by the Agricultural, Fisheries and Conservation Department. The FEHD receives a budget of HK$100,000 annually for dealing with wild pig hunting. Mo said that she will be pushing for the budget to be scrapped. “This is not a lot of money but it’s just not right. We should use the money on building fences around affected villages or some other measures instead,” she said. The lawmaker and other animal rights advocates called upon the government to disband the hunting teams. A young wild boar was euthanised last week after breaking its leg and biting a security guard who provoked it. According to government data, around 1,500 complaints relating to wild boars were lodged between 2010 and 2014. From 2009 to 2013, hunting teams killed 281 wild boars, about 56 per year on average.